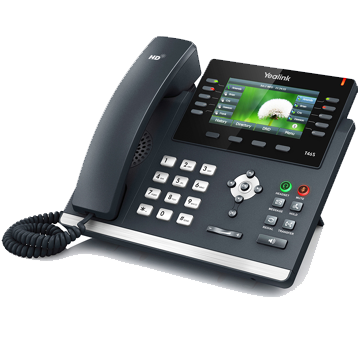 The Yealink T46S provides a feature-rich option for busy executives and professionals. With a 4.3" high resolution TFT colour display and built-in Gigabit Ethernet technology, this device enables rapid call handling and optional use of a Bluetooth USB dongle and Wi-Fi USB dongle. The phone features 10 customizable buttons each with dual-colour illuminated LEDs for line status information (switch between 3 pages for up to 27 buttons in total) the labels are shown on the phones digital display meaning no more messy paper inserts. For users who need to handle a high volume of calls, this phone is compatible with Yealink's EXP40 expansion module, with support for up to 6 modules, users can add up to 240 extra customizable keys to their phone. Acting as a replacement for the T46GN model, the T46S offers a more enhanced performance with added extras such as Opus Codec support and a faster, more responsive interface.